I've been busy trying to get to grips with Adobe Lightroom programme so no time for any challenges. Hoping to craft this weekend. I have however photographed a couple of layouts i recently completed. I started them months ago but needed to complete them. Some it was just the journalling that needed to be added. 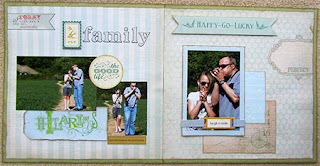 Although it looks like the layouts have no journalling it is either under the photograph or simply added to the back of the layout. Love my daughters to bits and we've been very lucky to have two gorgeous, kind, hardworking girls. Yet, they do both have their moments! Our youngest daughter though quiet at first is a very social person. This photograph was taken in the last few weeks at her school, when they were all very aware of how quickly they would all be going in different directions. With their GCSE's fast approaching, they were determined to make the most of the short time left to them including taking hundreds of photographs. Fortunately they still made time for revision and did well in their exams. She is of course texting. I love the angle of this photograph with the lovely blue sky. Lost and Found paper-My Minds Eye, i bought a pack and love it all. Prima flower, gorgeous as always and die cuts by Colorbok-Antique paperie. Lost and Found papers again and a few more of the glitter cut outs by Colorbok. Not sure whether my daughter and husband will be impressed with my posting this one. Love these photos taken in Epcot and the sunset colours echoing the colours of the dress my daughter was wearing was a bonus. Still trying to use up bits and pieces i have had for years. I yearn for the minimalist lifestyle but still want all my crafting stash! These were all started at different crops hence why they were all waiting to be finished. Though i love going to crops i scrap better at home, looking at these i want to start again and tweak them a little. Still done is better than perfectionism. Happily married with two newly adult daughters. Having been a stay at home mother for most of their lives i'm looking for other challenges to enrich my life. 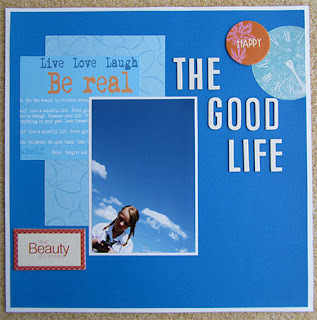 In the meantime i've set up this blog to share in the online crafting community.